Hi everyone! Welcome to the employee wellness blog. Our goal is to help you stay informed with up-to-date information and support you through this journey. It's time to be inspired and to live a healthy lifestyle! Being a caregiver can be stressful and hard work at times. While you are caring for others you may forget to take care of yourself which can have a poor affect on you emotionally, physically, and mentally. We want to help you take charge of your health and adopt and maintain healthy behaviors. The core to good health starts with getting the right education, knowledge, skills, support, and motivation. If you do not want to change your behavior, there will be no result. Once you adopt a behavior you need to maintain it, which can be the hardest part for people. You have to work hard and set goals for yourself, and if you don't stick to a routine and follow through, the behavior won't last. Have you ever heard of the Transtheoretical Model (Stages of Change)? This is an interactive framework for understanding how individuals progress toward adopting and maintaining a healthier behavior. Change is a process that unfolds over time through a sequence of stages. The goal is to get individuals to make clear modifications in their life and sustain it for a period of time so they do not relapse. Change starts with you and it won't happen over night. Start thinking about your unhealthy lifestyle habits and how you can take action on fixing the behavior. 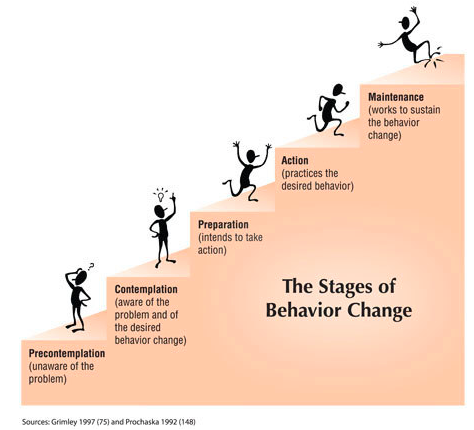 Have you ever tried changing a behavior but you were stuck in one of the stages in the picture below? Take a few moments to write down what stopped you from taking action and why you weren't able to sustain the new behavior. It's important to reflect on your past experiences so you are able to learn from your mistakes and be able tackle the obstacles in the future.